Spray cooking oil onto the chicken cutlets.. pan-fry the cutlets until brown both sides. Put it aside. Saute the garlic, onion and crushed coriander seeds until fragrant. Add rice, mushroom, fish sauce and chicken stock. Using rice cooker: put all the mixture into rice cooker, and arrange cutlets over the rice mixture. Cook as per cooking rice...Stir in fresh coriander. Alternative for the cutlets.... panfry the cutlets until golden brown and chicken is cooked. 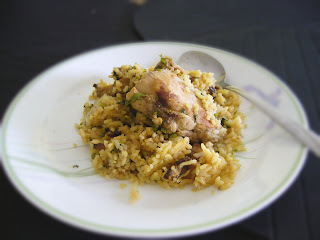 Serve the chicken on top of the coriander rice once it is cooked using the rice cooker method.